During the renovation in spring 2015 was a lot of work with the typical Alsatian façade colors: a beautiful violet in the kitchen, in the children's red, yellow for the pretty Fachwerkhäuslein the lawn. The furniture and furnishings have been carefully selected and matched. Through the ceiling height and the large living space will find a high level of comfort. Real Eye-Catchers are the pastel colored bricks at the entrance and in the children that were specially allowed to view. Here and there "dames Jeanne" - beautiful carboys, witnesses of the Alsatian farms widespread distillation of cherry, plum or mirabelle brandy. In the dining room a 100 year old tiled stove, highlighted faces a trompe l'oeil wallpaper in barn look. Surrounded by a wall decorated box balls and hydrangea bushes in bright purple and blue lovingly created lawn. A large courtyard of more than 100 m2 with parasol, garden furniture, rocking promises many relaxing hours at a leisurely glass Alsace wine with family and friends. Between the numerous flowers, old wooden barrels from local Cooper (see Musée du Petit Tonnelier). Directly opposite your children on the large playground with inline skates or bicycle turn your round, playing football, basketball, etc.. Bicycles are provided free of charge. In just 3 km away, the Aqua Pool Ried offers a pleasant cooling on hot days (indoor and outdoor pool with slide). An excellent location for a relaxing holiday in the country! Conveniently, yet dignified live and visit the beautiful Christmas markets in the region (eg. B Colmar), which is also possible with us. You want fun and adventure? Then you reach the leisure and amusement park in Europe only 20-25 minutes' drive from the holiday home. Beautiful house, very well equipped. Friendly owners. We had a great stay of one week. Whilst bikes were available at the house, we did take our own. The surrounding countryside is great for cycling, with many dedicated cycling tracks and paths. Beautiful places such as Colmar are within easy reach by car but can also be reached by bike. There are a few restaurants nearby and a boulangerie in the neighbouring village. The outside space in the house is great for relaxing and eating outside. The house itself was very comfortable. We had a really enjoyable holiday. The owner was friendly and helpful. Many thanks. Très beau gîte avec tout le confort et très bien équipé. Bon accueil avec petits cadeaux et la sympathie de Mme. Grand merci à vous nous ne manquerons pas d'en parler. Ruime woonkamer, keuken en slaapkamers. Goede matrassen en dito zitgelegenheden. Ruimte om de woning zeer royaal en overal zitgelegenheden op de binnenplaats. En niet te vergeten een geweldige schommel. Gastvrijheid van de eigenaar was top. Wir waren 2,5 Wochen Gast in dieser wunderbaren Ferienwohnung! Ruhig gelegen um abzuschalten, zudem ist die Lage ideal um Ausflüge in beide Länder zu unternehmen. Man hat den Hof und die Ferienwohnung für sich zur Verfügung und an den Tomatensträuchern und den Kräutern durften wir uns auch kostenfrei bedienen. Die Einrichtung ist top und uns fehlte es an Nichts. Es gab Fahrräder in verschiedenen Größen zur kostenfreien Nutzung. Die Vermieter sind unglaublich herzliche Leute, unsere Kinder durften auf dem Traktor mitfahren und sie haben mit uns einen Flammkuchen Abend gemacht. Es war eine wunderbare Zeit und wir haben den Aufenthalt sehr genossen. Ein herzliches Dankeschön!!! Estuvimos muy a gusto en la casa. El primer día Schatt Chantal nos acogió muy bien y nos explicó como funcionaba todo en el apartamento que, por cierto, está muy limpio y todo nuevo. 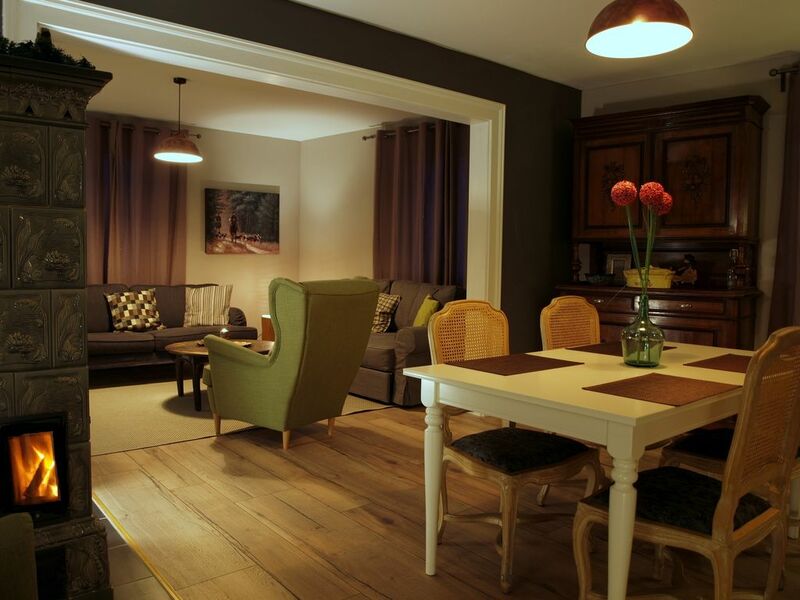 If you opt for "La Mirabelle", it is because you want a centrally located property that is furnished with style and heart and lets you feel that you are in Alsace. Families are within 20-25 minutes the famous Europa Park in Rust; in the opposite direction you are within 20 minutes on the tourist wine road and in the beautiful vineyards of Alsace. The villages in the Grand Ried are all connected with wide cozy "pistes cyclables" (cycle routes), so you can explore the beautifully decorated villages along the Rhine by bicycle wonderful. For your evening walk along the canal to experience an impressive color spectacle when the yellow-red glowing sun sets behind the Vosges.